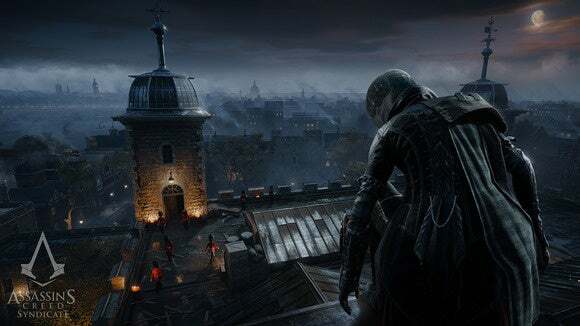 The ghost of Assassin's Creeds Past comes to haunt us in Victorian London. We go hands-on to see what's changed—and what hasn't. Wheel out the hidden blades and hoods—it’s time for a new Assassin’s Creed. This year’s entry, Syndicate, finally brings the game’s Forrest Gump-esque historical tourism into the modern era. We’ve done the Crusades, the Renaissance, the Colonial era, and now it’s time for Victorian England, for “Please sir, can I ‘ave s’more?” and bobbies and steampunk without any of the cool steampunk stuff. But it's 1868, so we still get new modes of transportation (carriages, trains), new gadgets (a zipline? ), and soldiers in silly hats. Actually, silly hats all around—those enormous furry black hats for the Queen’s Guard, top hats for everyone else. Probably handkerchiefs too. And two new protagonists, of course. 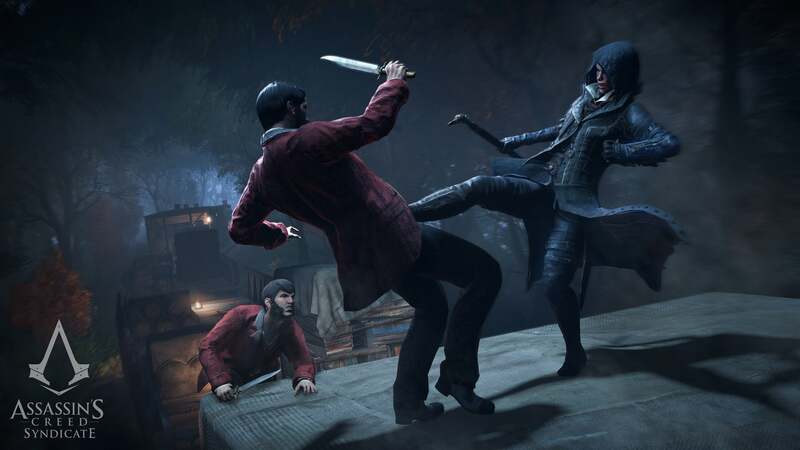 Ubisoft hammered home during our recent demo that each character plays slightly differently in Syndicate. Jacob’s your stereotypical post-Ezio Assassin’s Creed protagonist, a brooding young man with a flair for fashion and fisticuffs. His sister Evie is the stealthier of Syndicate’s dual protagonists, though she can also hold her own in a fight. It was Evie we used in our hands-on last week. 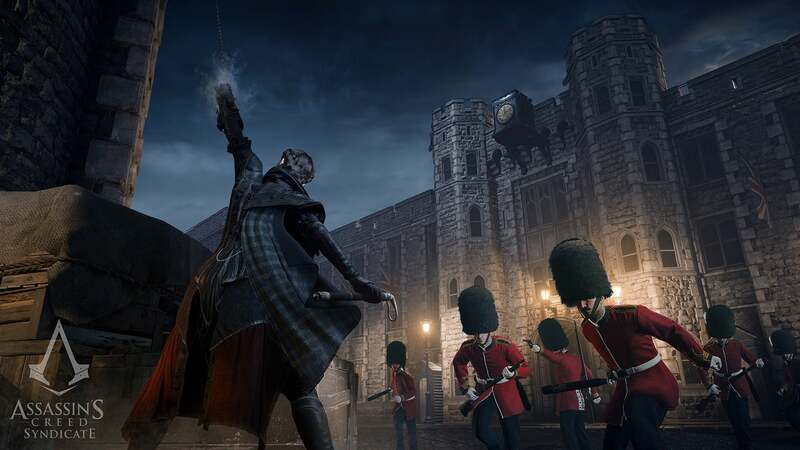 The mission: Infiltrate the Tower of London and kill off Lucy Thorne. A quick Google search makes me believe Lucy Thorne was not a real person, though I can’t be sure. A quick use of my brain tells me that in the context of Assassin’s Creed, Lucy Thorne is almost certainly a Templar. The assassination mission we played through was similar to the enhanced, “Seriously it’s called Assassin’s Creed,” missions in last year’s Unity. Upon arriving at the Tower of London, I was shown a number of ways to infiltrate the fortress’s White Tower—a rogue guard, the Master of Keys, or an imprisoned constable. These are the “stealth” options, though stealth is on a sliding scale. Or you can just walk in and kill Lucy Thorne, if you’re so inclined. I decided to take the Master of Keys route. I scaled the side of the White Tower with the new zipline/grappling hook thing, which cuts traversal time to a fraction of its former length. It’s a bit of an odd choice—one that indicates this series is increasingly less about the parkour that made it famous to begin with. Regardless, I entered the central courtyard, watched the Master of Keys walking in circles (for some reason), dropped down, and shoved a knife so hard through that guy’s back. “You could’ve just…taken the keys,” said the developer watching over my shoulder, clearly not understanding that he’s working on a game titled Assassin’s Creed. But he did take this opportunity to show me one of Evie’s new features—“Chameleon,” a.k.a. that cloak Frodo had in Lord of the Rings that made him look like a rock. At any point, Evie can stop moving and just sort of blend into the environment. Guards need to essentially trip over her in order to discover she’s there. After murdering the Master of Keys, I just sort of sat down in an empty field and prayed that no guard walked close enough to figure out I was indeed a person and not a person-shaped piece of fabric. It’s a bit silly, but I guess it allows Ubisoft to make more realistic environments instead of filling each area with waist-high bushes and cupboards to hide in. From there, things played out like a pretty standard Assassin’s Creed mission—unlock a door, waltz into a building, avoid guards for as long as possible, eventually get caught, murder all the guards one by one, then murder Lucy. Ubisoft’s been touting overhauled combat for both Syndicate and Unity, but I didn’t notice anything different per se. I murdered about fifteen guards in a row when I got discovered, and I was playing as Evie (ostensibly the “stealthier” of the two siblings). Chalk some of that up to skill. There’s an eerie familiarity to playing Assassin’s Creed at this point. 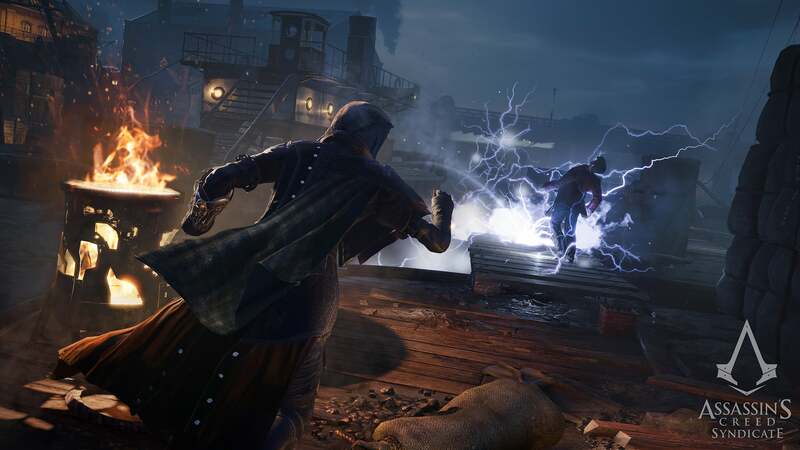 If we count Assassin’s Creed III: Liberation (which we should, because it’s a pretty decent game), then Assassin’s Creed Syndicate is the tenth game I’ve played in the series. Ten games. I’m pretty sure that’s the most I’ve played in any series, when I stop and think about it. Most of the properties I enjoy never even get ten games, and some others I’ve fallen in and out of over the years (Call of Duty). Ten games is a lot. And so even as the developer explained to me what’s “changed” with this year’s Syndicate, I just sort of nodded along and got to playing. Why? Because we’ve been through this a lot now. When you play Assassin’s Creed Unity versus Assassin’s Creed II, sure, it’s clear quite a bit has changed over the years. But it’s also clear how much hasn’t changed. Assassin’s Creed is still Assassin’s Creed, and some of the biggest problems in the series—like combat—are still an issue almost ten years later. 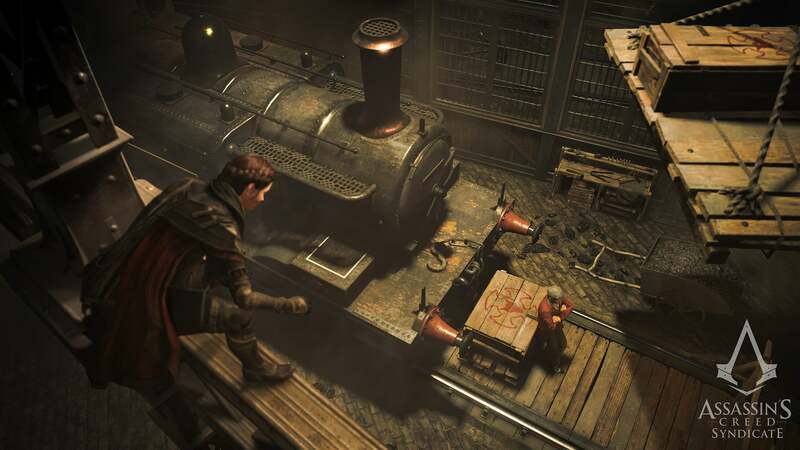 Syndicate also hasn’t fixed Unity’s much-vaunted “overhaul” to free-running, which turned something clumsy and broken into something sticky and broken. I had an awkward moment during my Syndicate demo for instance when I tried to jump over a waist-high fence and it just wouldn’t let me over. It’s the sort of jankiness that was forgivable in the first game, when so much of the series It's felt “new.” In 2015, it’s annoying. Expected by fans in a sort of “Well, that’s Assassin’s Creed” way, but nevertheless annoying. What’s worse is that some of these pesky lingering issues have since been improved on in other games—the free-running in Shadow of Mordor was better than Assassin’s Creed, for instance. And after playing some of Syndicate, I can’t say I’m a huge fan of the Victorian-era setting. One of my favorite things about Assassin’s Creed in the past was its ability to set games in places/times where we never see other big AAA games—like Renaissance-era Florence. Even the American Revolution was a weird setting for a third-person action game. Victorian London? Thanks to steampunk and a certain famous detective, it’s a setting almost as overused as World War II or a Middle Eastern desert. Perhaps there’s a legitimately interesting story for Ubisoft to tell in this setting, and to their credit the environment artists have certainly nailed the sooty, grimy feel we typically associate with Dickensian London. I’m not sold on the game from the short demo I played, though. And it’s not because I don’t want to be—I’ve played ten Assassin’s Creed games and for some reason I keep coming back. I’m 50 percent in love with the series, 50 percent obligated to play them because I feel like I already played so many…why stop now? 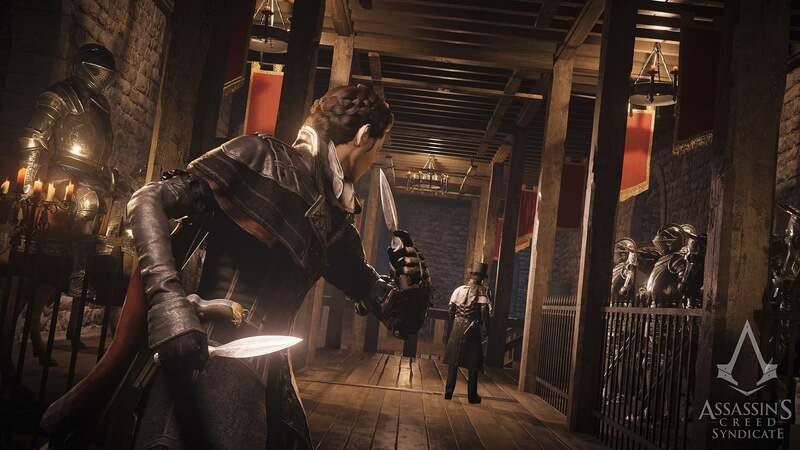 But I can’t help hemming and hawing about Syndicate, in part because I’ve only played one small portion of a game Ubisoft says is “bigger than Unity”—a game that was already enormous. Can Ubisoft overcome the standard Victorian Era tropes we’ve seen tread and retread in countless pseudo-Victorian games/movies/books? Can it tell a story more interesting than the simplistic class warfare explored in Unity? Will the PC port run like a proper PC game instead of a mangled pile of garbage? For the answers to those questions (and more), we’ll have to wait until the official release in October.